Have You Heard of Skepticon Yet? While we’re pretty sure that most Holistic Survival readers have their ears and eyes tuned to the pulse of realistic survival information, we wanted to take a moment and make sure everyone out there is aware of the annual gathering of skeptics at an event called Skepticon. Originally touted as an open discussion regarding the existence of God, by the third year topics had expanded to include discussions and presentations on anything that fosters a sense of skepticism: feminism, sexuality, a nontheistic approach to death, and many others. Where can you find Skepticon? Surprisingly, Skepticon has made itself quite at home in Springfield, MO., far from more renowned metropolises, an area affectionately called the “Buckle of the Bible Belt” by some – not to affectionately by others. On the surface, this geographically central location makes sense, as Springfield is almost exactly smack dab in the middle of the continental United States. What the average person might be unaware of is that the city also serves as the international headquarters of the Assemblies of God, as well as a handful of religious universities. The idea of a skeptics conference got off to a flying start in 2008 when the Missouri State University chapter of the Church of the Flying Spaghetti Monster invited a couple of well-known atheists to campus to criticize belief in God. Lots of people showed up. The following year they decided to do it again, though the second time around had more planning and found itself graced by the presence of New York Times best-selling author Victor Stenger, and thought leaders in the field of religious skepticism: Dan Barker (Freedom from Religion Foundation), Rebecca Watson (Skepchick), DJ Grothe (James Randi Educational Foundation), and more. Second year Skepticon highlights included a debate over the question “Does God Exist?” Another pitted well-known atheists against top scholars from the Assemblies of God. It was also decided at Skepticon II to add a Pub Night and extend the event to two days. In 2011, Skepticon IV was attended by 1,200 people, making it the second largest skeptic/atheist conference in the United States. Topics have again expanded to take in supernatural investigations and a panel of more than one dozen speakers. The fifth iteration of Skepticon is scheduled to hit Springfield this November 9-11. While attendees and presenters alike have a lot of fun at Skepticon, we shouldn’t overlook the fact that a little bit of skepticism can get you a long way in life, and trust can get you killed or at least thoroughly taken advantage of. “The Flying Spaghetti Monster (FSM) is a satirical deity used in the Church of the Flying Spaghetti Monster to promote Pastafarianism, a parody religious movement. This movement challenges the intelligent design form of creationism promulgated by the Seattle, Washington based Discovery Institute. The “Flying Spaghetti Monster” was first described in an open letter written by Bobby Henderson in 2005 that used satire to protest the Kansas State Board of Education decision to permit teaching intelligent design as an alternative to evolution in public school science classes. In that letter, Henderson parodied the concept of intelligent design by professing belief in a supernatural creator that closely resembles spaghetti and meatballs. 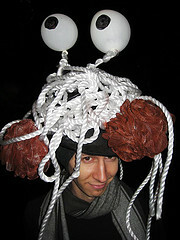 Henderson further called for Flying Spaghetti Monsterism to be allotted equal time in science classrooms alongside intelligent design and evolution. Alrighty then. Skepticon will be here before you know it. Who’s with us? In case you’re way too busy to waste time keeping up to date with this event, no worries, we’ll remind you again before it gets here and maybe even report live on the festivities – err – academic discussions.